All of the orangutans in the world would probably only fit into a college football stadium. Today, scientists are announcing that just one of the sections of that stadium is actually an entirely different species. And it’s already in danger. The international team identified Pongo tapanuliensis based on skull shape and genetic data from an isolated population of 800 orangutans in the Sumatran Batang Toru ecosystem. This number was almost certainly much larger in the past. The scientists had few samples for their research, but the robust analysis convinced them of the differences in this tiny group. “We realized that these guys were special,” study author Michael Krützen from the University of Zürich told Gizmodo. Hints to a new orangutan species began popping up in genetic data a few years ago, explained Krützen. 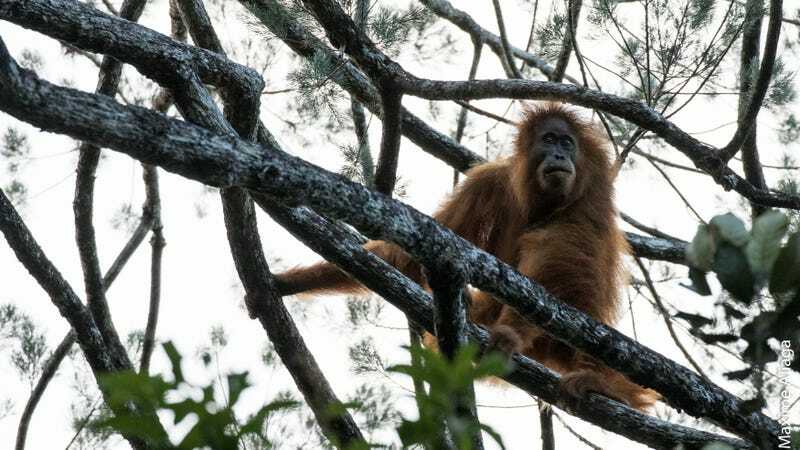 P. tapanuliensis has genetic markers in its mitochondrial DNA, a special set of DNA passed only from mothers to children, that looked more similar to the Bornean orangutans’ than the nearby Sumatran ones. The team also acquired a P. tapanuliensis skull, whose shape seemed to differ substantially from the skulls of the other species. A genetic analysis revealed that the new species likely split from the rest of the Sumatran population around 3.4 million years ago. They intermingled with the other Sumatran species occasionally, but this seemed to stop completely between 10 and 20,000 years ago. Female orangutans typically stay put, so any genetic material flowing between the populations would have to come from intruding males. But the study has its limitations. The scientists identified P. tapanuliensis based on only one physical specimen and two individual genomes, according to the paper published today in Current Biology. The skull also fell within the possible ranges of skull sizes for the other populations, notes Vogel. And it’s important to note that the species probably could interbreed. Many scientists don’t consider interbreeding important when it comes to new species—it’s not about if they can, but whether they actually would in the wild. Others didn’t find the scant number of specimens a problem for identifying the species. “I used to work in a museum and sometimes you have very limited material available,” especially in the case of fossils, said anthropology professor Vincent Nijman from Oxford Brookes University in the United Kingdom, who also wasn’t involved in the study. If the greater scientific community accepts P. tapanuliensis as a new species, then it would be an incredibly rare group—800 people would only be enough to fit into a party at a large ballroom or warehouse. That means there’s conservation work to do. Nijman thought this work was the responsibility of Indonesian government, and pointed out that the population is almost certainly in decline.